No time to post recipe ... but this roast turned out so well I just had to take a couple nano-seconds to share a photo. May you all be inscribed in the Book of Life for a healthy, happy year! Just in case you still haven't yet decided what to serve erev Yom Kippur, here's a suggestion. Serve with whole wheat couscous and a cruciferous veggie or two to fill you up and help ease the fast. 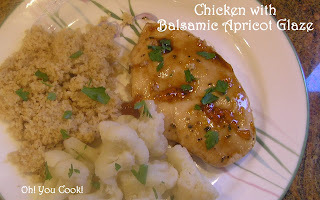 This dish is pretty similar to my honey-glazed cornish hens with apple salsa. Except without the honey. Or apples. And it has rosemary in it. Okay, so it's not so similar. But it's quick and easy, two of my favorite words lately when planning meals. Lightly grease rimmed baking pan with the 1 tablespoon olive oil (reserve rest for later). Place breasts in a single layer on prepared pan. Bake for 15 minutes.